The appropriately up-again-down-again fortunes of Rollercoaster Tycoon 3D are heading up again: developer n-Space has announced the game should be out this Spring. In fact, as Spring starts today, that gives us a fairly large three month window of expectation. We love all the excitement and anticipation for RCT 3D and want to give you the most recent update. Currently, the title is slated to launch towards the end of Spring. As soon as we have more information, you’ll be the first to know! I have the computer version, they better have a LOT of improvements if they expect me to buy it. This game is just fancy shovelware to me. It's a bad game with weak concepts, but a absolute to of those concepts so you don't feel like you got ripped off. Looking straight at this game, it looks like a piece of rubbish. But, when my friend started talking about it, It changed my entire view towards this game. THANK YOU!!! Eagerly looking forward to building some insane roller coasters and watching my poor maintenance staff having to clean up to subsequent messes! @Some_Chords Which one are you talking about? There have been 3 installments in the series. I could see your point about the 1st one due to it's age and the comparrison of today's simulation games. Personally, I have really fond memories of playing the original RCT back when I was young. I enjoyed designing the different types of coasters. I tried RCT 3 recently, and the improvements to the designing of the coasters (and everything else added) blew me away. Also, the ability to try out the coasters in the first person perspective was amazing (especially when you used the cheats to take off the limitations and build them as high and as fast as you wanted ). Just thinking about trying them in first person on the 3DS sounds AWESOME! I'm glad this game's back on track . . . pun intended. Phew, that's a relief. Excitement mode: reactivate! RCT is certainly NOT shovelware, that is certainly the statement of the uninformed or ignorant. Minecraft is more shovelware than THIS, and that isn't either.. If you people want to support and inspire them, post to thier facebook page...If this and Fire Emblem were the only two games released all year for the 3ds, I'd feel satisfied. n-Space is in charge of developing RCT for the 3DS? Have they developed a simulation game before? Aww yeah, definitively going to get it when it launches. Off topic I thought that Spring starts on the first day of March? This game would be ideal for 3ds. This is surely insta-buy for me. RCT AR cards would be sweet! I'd probably need to use one of those giant AR cards for the tracks I would be designing! @some_chords How dare you call RCT games shovelware. I loved RCT 2 and 3 (and their expansion packs) and look forward to playing it on 3DS. I haven't played Rollercoaster Tycoon since like, Rollercoaster Tycoon 1. Still not sure this is for me, have to see more about it 1st. I think riding your own Rollercoasters in 3D is a great idea, assuming the 3D done well, which many releases have proven is not always the case. If it's anything like Simcity DS, then I wouldn't buy it. Not many PC games get ported well to consoles/handhelds. I loved RCT and RCT2. Never played 3 but I didn't want to. It sorta lost the cartoony touch the first 2 games had. PS. Calling the series 'shovelware' is a joke. They were great games in those days. Darn, as an avid lover of coasters, I'd like to get this, but there are just too many good games coming out. I'll put this on my backlog though, if I ever get the extra money, or if the 3DS has another dry spell in the future, I'll pick it up. 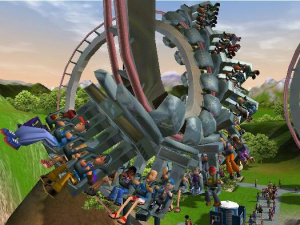 Are the rollercoaster typhoon games anything like thrillville on the playstation 2 or better? I love thrillville, but im not sure about this game because I never played this series before. @Andrewroxsox They are way better than thrillville. Alot more interesting than thrillville. You can put rides in any spot of the park you want, not just small, specific spots like in thrillville. Also, you dont have to worry about how much power/electricity you are using, so you can have as many rollercoasters as you want. It is really fun and in Rollercoaster Tycoon 3 on pc, there is sandbox mode where you can build all kinds of rides and not have to worry about how much money you have. there are no minigames, just building parks/rollercoasters and fulfilling the acheivements on each park. It is a really fun game to try and all of the expansion packs make the expereince even better. Phew, I was worried. Looking forward to this! I have another question that isn't meant to be answered right away: how will the game play out that makes it successful? If the game is rendered in 3D (not stereoscopic 3D), they better put a lot of thought in the series's core gameplay mechanics and bring something new to the table because it's virtually impossible to give players the freedom and flexibility like its PC counterparts (wouldn't be surprised if there were limits of how many rides and Rollercoasters there are) due to the system's limited hardware. My opinion: it'd be lovely if they do go with this approach, for I'd like to see Rollercoaster Tycoon at its simplest and have it remind me of why I liked the game in the 1st place. Sadly, this would put off any players who liked the game as a sandbox. I can't think of any other approach that'd make this game successful, whether it's merit or sales.